Even since I learned I was pregnant, I’ve been more conscious of products I put into and on my body. I switched shampoo and conditioner and carefully looked for moisturizers as my skin tends to be dry, and I heard it might get progressively drier in pregnancy. 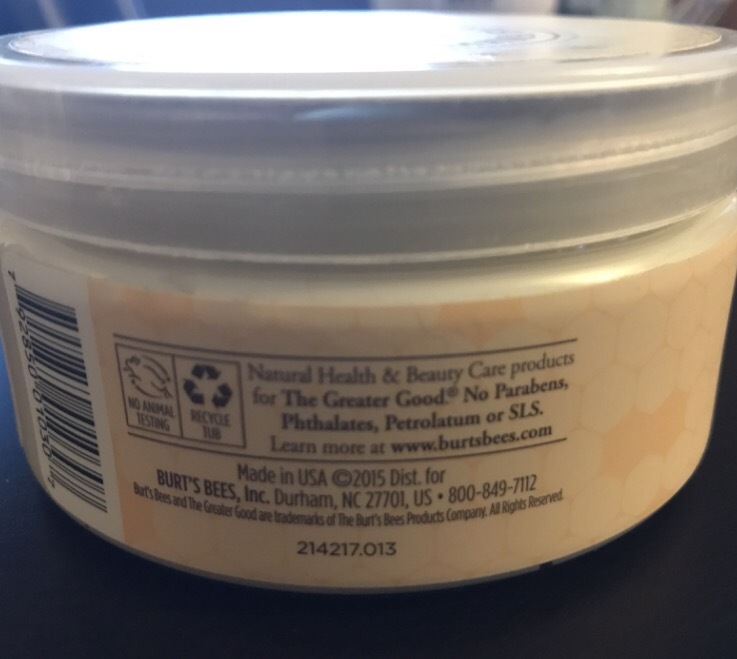 I looked forward to using this as it’s from one of my favorite green and animal friendly company’s Burt’s Bees. 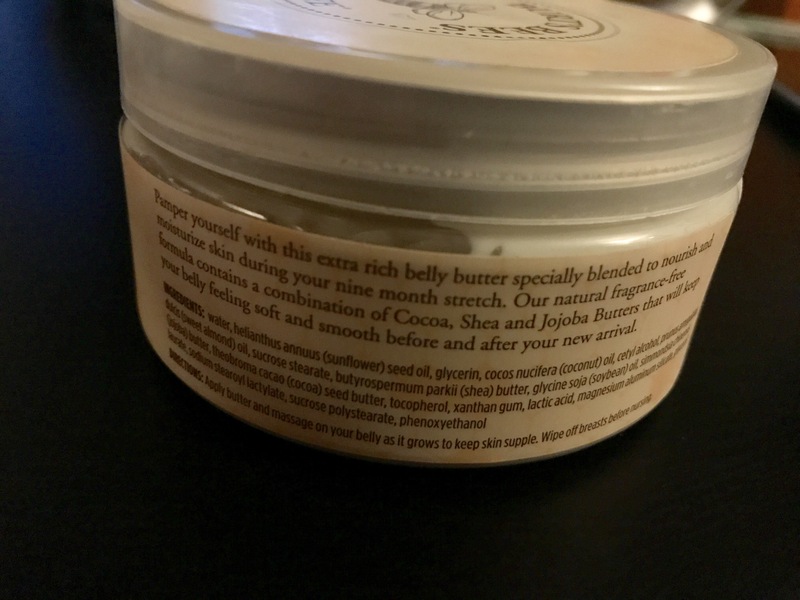 I had high expectations for Mama Bee Belly Butter, based on both my experience with some of their other products and positive reviews on Amazon.com. Actual product aside, I really like the crisp and clean design of the labels. The product used to have a darker label yellow that matched the color on most of their products that are for the general public. This switch has confused some people, who originally thought this was a knock off product. While some say the cream has no scent, I detect a faint cocoa type scent, which being one of the key butter ingredients along with shea and jojoba makes sense. The directions seem simple, but some key things are missing. How much do you put on, how often and are you supposed to but on your breasts or just wipe off it you get it on them and are nursing, are all things I wish I’d known. This part of the product shows no parabeans, no petroleum or SLS, all things that should be avoided in pregnancy. It also is cruelty free and the container can be recycled, all things that make me feel good about this purchase. Although my skin tends to be dry, I’ve never found my stomach to have dry skin per se. Still even after one use, my skin felt a lot softer and moisture rich. I’ve been using it daily and not seeing an instruction not to, have been putting some on my breasts as well. My research on this product shows that customers from several years ago expected it to help prevent stretch marks. It does not say on the container that it will, though when it says it will moisturize and make skin supple, it’s possible someone might infer that. Those that said it worked for them stressed it could prevent stretch marks, but not make ones that were already there fade away. I’ve been lucky so far that even when I gained and lost weight in puberty and more recently in preparation for the weddings of family members and myself, I haven’t had any stretch marks. 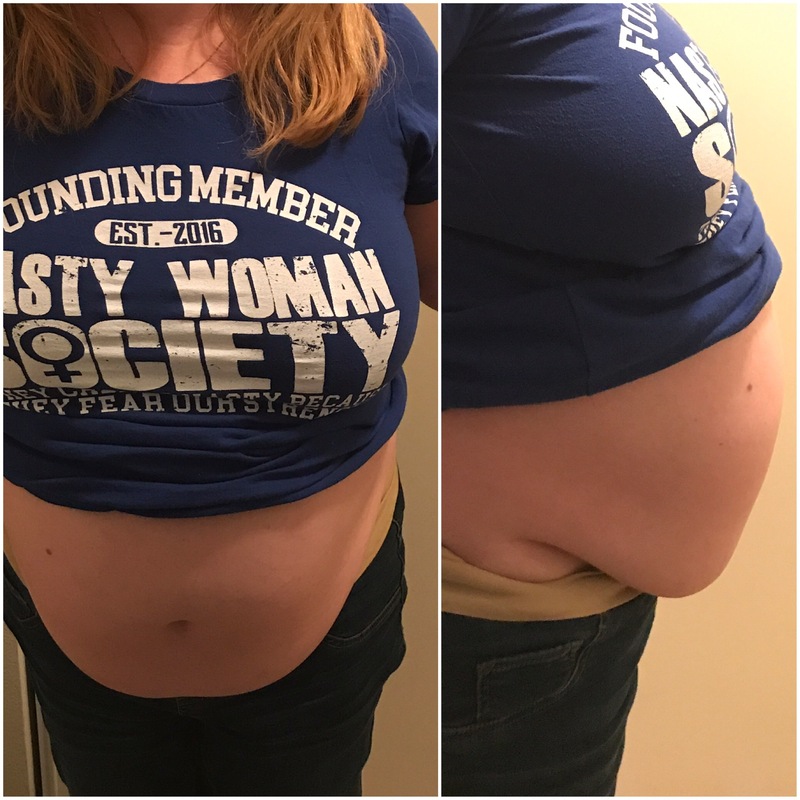 Below are two belly photos taken yesterday at 14 weeks and 6 days pregnant. So, I’m going to keep using this and later in my pregnancy, I will do part two of this review my skin softness and stretch marks. With a great product, yet skimpy instructions, this product is rated: four baby booties out of five.